Just under a year later, Nova and I had long sold our chocolates. We had done a lot of research, and come to the conclusion that flying down there, having our adventure, was cheaper than shipping the chocolates in from Guatemala. An airline had just opened flying our route, and tickets were cheaper than sending a heavy pound package. I was loving this scenario because my future looked like a four day adventure twice or three times a year. I waited until tickets were at a low $115 roundtrip and booked us for another pickup. I love traveling with a crazy circus troupe around the world, but this time it was just myself and Nova. I was so down with our spirited duo adventure. This time our six-hour adventure out to Lake Laguna was a little more familiar. For this was technically the third time I’d followed this route. A forty-five minute ride from the airport and you arrive in Antigua. A mysterious city of doors that has an even amount of spanish and traditional architecture. Doors, upon doors, which to me is mystery after mystery to be explored. Even though it is tourist haven, I love this city in that food markets are always open, hostels are plenty, and you can choose your traveling style from backpacker, to sipping papaya and lounging by sun soaked pillars and spanish art. 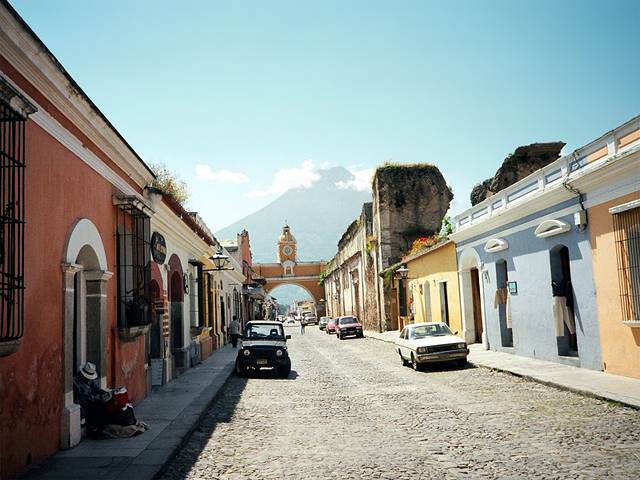 This is generally the gate city for travelers venturing farther out past Guatemala’s bigger cities and towns. I tend to always spend the night here from the airport knowing I’m leaving amenities and the convenience of the modern world for a while. 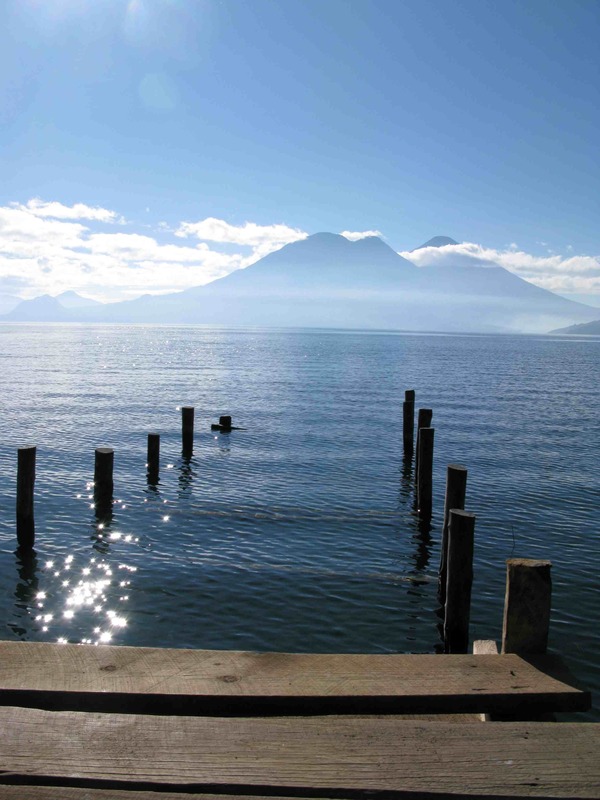 From there, a to five-hour van ride to Lake Atitlan. 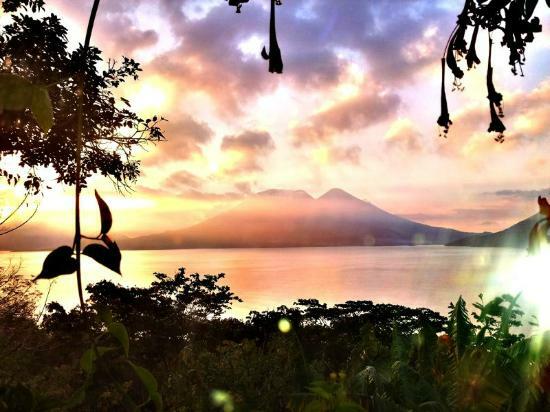 Although Diego is in San Pedro, Nova and I decide that we way more enjoy the seclusion and quiet of San Marcos, so we make that our home for this quick four-day pickup. We rent a tree house bungalow right near the boats boarding dock. This was a room just big enough to fit two cot style twin beds with a single wooden chair. A large window takes up much of the fourth wall so that when you open, there is the most majestic view of the lake, volcanoes, and sky. We get hypnotized by the view and become like perched birds watching the water and dusk moving in. We make a joke about scorpions in our beds, and both laugh nervously and keep obsessively looking on the ground. Two minutes later, I tell Nova….don’t move, don’t panic there is a scorpion looking creature right by her hand. I know that a certain color scorpion is deadly and other colors are not, but at this moment I have no idea which color is which. We debate for an hour how we deal with this creature. How do we move him out, even when we do there are probably five more in the room we can’t see…Eventually we agree to leave it where it is and do our best at harmonizing with our new home. Hello, my fellow Guatemalan. Don’t bite and we’ll all live here together as friends! Scorpions are extremely hazardous looking and it wasn’t easy to relax, but a couple of hours go by and we soon melt into the tides of the forest. 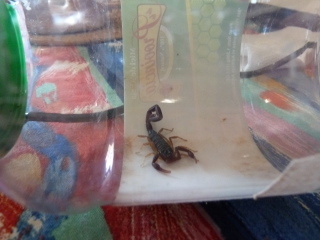 Nova ended up getting stung by our scorpian roomie…We used some oils and again had a nervous laughing fit. I told her, she couldn’t die because we had just become business partners. I guess it was the right color or Nova is an alien, because she never had any side effects. Even if she had, we were in a place that didn’t have access to any sort of modern medicine. No antibiotics, no bacteria cream, no toilet paper, no hot water….so phew!! This was our night to chill and take time to appreciate our new venture. The next day we’d visit Diego put in our order, and wait! As the stars came out, we sat in that window and sang songs to the sky, sketched business card designs and goo-goo gawd at our surrondings. This time we would be smuggling a larger amount of chocolate than before, and needed to have all our details worked out to make everything go as smoothly as possible. I loved the idea of being a smuggler of chocolate!! I loved supporting a wonderful small village business that was run by all family. I had never experienced the relationship I had with this bar of chocolate. 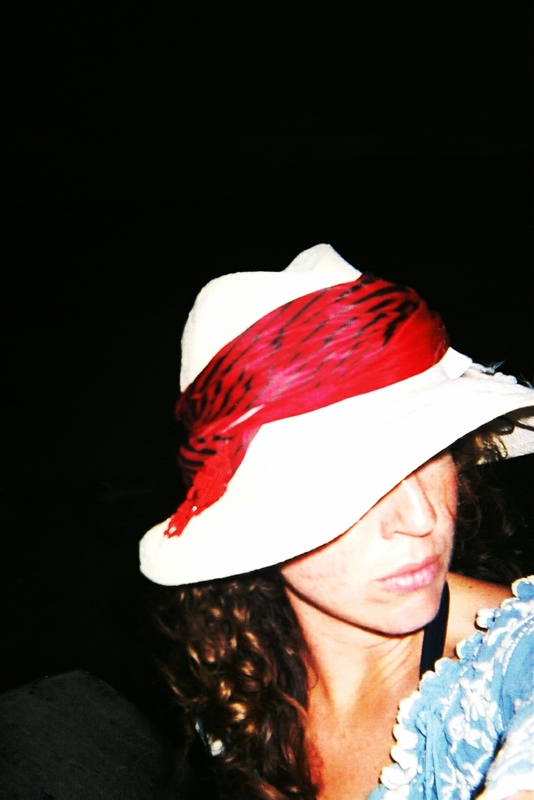 It was my medicine, my dessert, and my heart, and this time we were each filling two massive suitcases. The souvenir excuse in customs was no longer going to work…Plus, it’s not just getting caught for bringing in food substance between borders, it’s also the risk of the bars getting damaged in transit, being confiscated, and being destroyed through random baggage search. 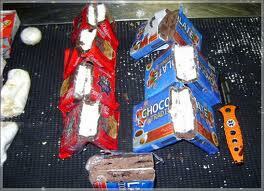 Also chocolate has long been a way for drug smugglers to transfer drugs. Even though we were just trying to get in the chocolate, this is what customs officers are looking for that could destroy our chocolates. If we were to get searched our chocolates would definitely get ruined. Our second trip was another success. We didn’t sleep, ate only fruit and chocolate and will never forget our fortune! If you were to go anywhere in the world to bring back one thing….what would it be?? How far would you go to pick up your favorite piece of chocolate heaven? I think it would be … Textiles from India… I really want bright colorful textiles to cover my walls so I can live in a real gypsy den.. I really want them but they are really expensive imported ! I would always smuggle food. Seriously. Candy, chocolate, thai curry (! ), tea (! ), and FRUIT. I would love to bring some delicious mangoes back from Colombia, because their fruit is apparently bomb. I actually got stopped going through customs from the UK into the US because I forgot to claim that I had an apple in my duffel bag that I had actually bought at the beginning of my trip and forgot was even in there. The security agent didn’t seem to believe me, so I told him he could have it if he wanted because I certainly wasn’t going to eat a two-week-old, mealy, bruised apple. He let me go after that.